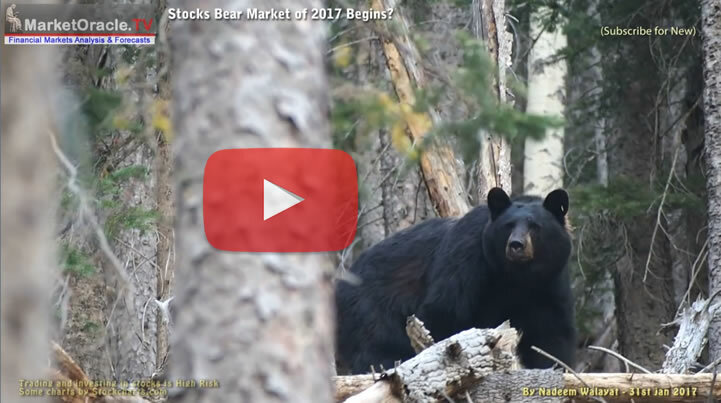 Stocks Bear Market of 2017 Begins? Shorting the Dow At its Peak! This is a quick heads up for what could prove turn out to be the start of the stocks bear market of 2017. Those who have followed my analysis will know that after having ridden the bull for nearly 8 years, that following the election of Trump and the resulting rally right to the very edge of Dow 20k, that I concluded early December that it was the time to start distributing stocks holdings accumulated during the life time of the of the bull market, specifically seeking to reduce my stocks portfolio holdings by at least 50% as the Trump Reset looked set to soon usher in a bleak period for stock prices for much of 2017. The way the market behaves, we might see a double top now or even a spike a bit higher. But 20100 still looks a good entry level. So far my arrognace paid off. I exited first short at a good profit, then put on a second short at 19940, that got stopped at a small loss, gave back about 20% of my proft. My current arrogant trade is a limit order to short at 20090 which so far has not been triggere, given the dows at around 20070 I may just short it at the market with a stop at 20150.
note, don't be under any misconseption I am in arrogant trading mode :) This is what I am like after a big win (banking bull market profits) so I guess until the market smacks me in the face I am goign to be trading pretty close to the edge of what a sane trader 'should' do. P.S. DON'T TRY THIS AT HOME ! I HAVE 30 YEARS EXPERIENCE !